August – wow I’m late!! 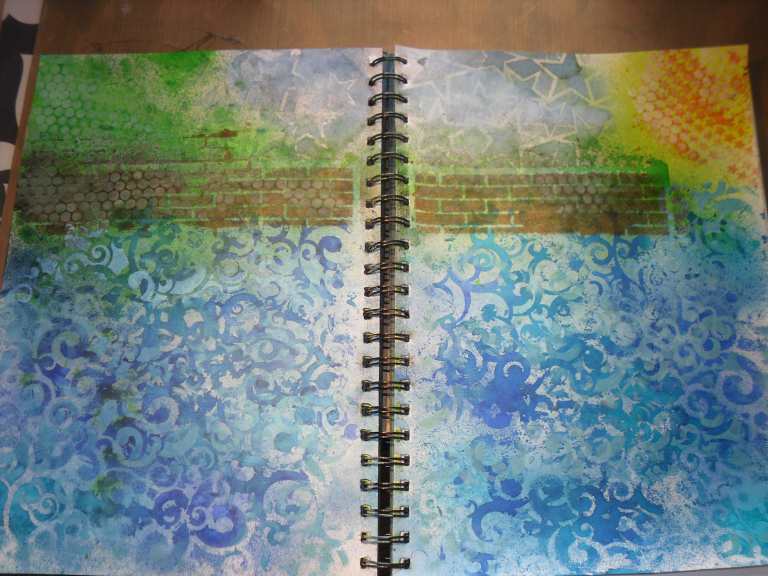 August page for the Calendar challenge. I just about did August in the right month. Although saying that I still haven’t written ‘August 2012’ on it yet. I wanted to do it as seagulls in the sky but I’m not sure how yet. I was totally uninspired until I went for a short holiday to Falmouth in Devon and woke up one morning and realised that I wanted to use the thousands of little boats in the harbour as the days of my month. I got a Michael Powell stamp in Trago Mills (brilliant sells everything shop) with a picture of a similar town and a lighthouse and it grew from there. I didn’t use the stamp in the end as the scale didn’t work on my page but I drew my own version of some of the houses and the lighthouse on vintage music paper coloured in with Inktense pencils instead. I used Dylusions inks, crafters workshop templates and a stamposaurus brick template for the background and then drew the buildings. The boats were a light bulb moment in the aforementioned Trago Mills decorating department on my last day in Falmouth when I saw all the paint charts and thought I could use them for something. 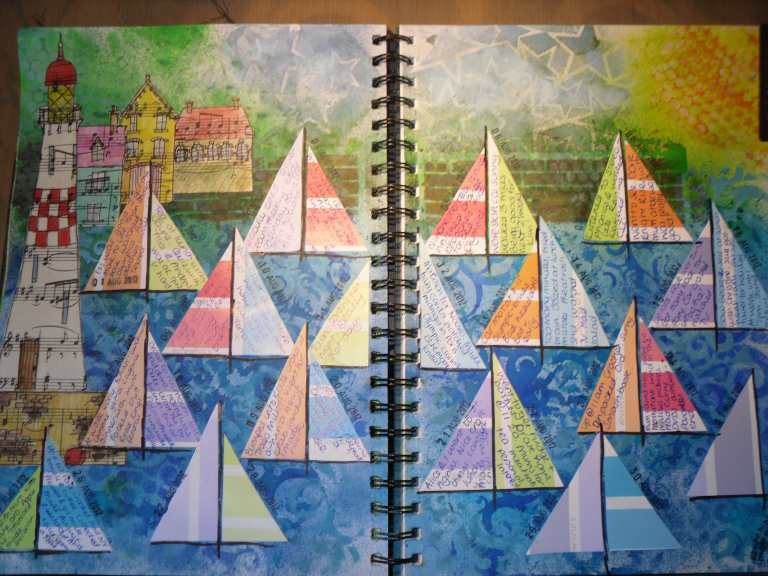 I cut them into triangles and voila – boat sails! I think the white strips look quite nautical!! The first day I went to Trago Mills I saw a familiar looking lady and then recognised her dog from her blog and realised that it was Kate Crane of the Kathryn Wheel blog! It was lovely to meet her, and such a nice surprise. Completely random to meet in Cornwall as well. I was so astounded that I forgot to take a photo though.